Leeuwenhoek was born Antoni Thoniszoon on October 24, 1632, in Delft, Holland. He later took the surname Leeuwenhoek (“Lions Corner”) from his family’s house located at a street corner near the Lions Gate in Delft. He received little formal schooling, but was apprenticed to a draper in Amsterdam, who taught him to examine textiles closely with a hand lens. In 1652, Leeuwenhoek opened a drapery shop in Delft. In 1660 he gained a position within the Delft city government, a situation that left him relatively free to pursue his consuming interest in microscopy. 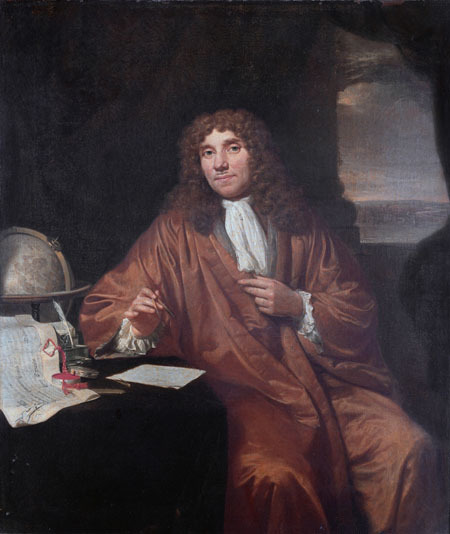 In 1671, Leeuwenhoek built his first microscope, which bore one doubly convex glass lens he ground himself. Throughout his life he crafted more than 400 lenses that magnified objects up to almost 300 times their original size. In 1674, Leeuwenhoek was the first to observe living cells, which he called “animalcules.” The cells were protozoa, members of the kingdom now known as Protista. Two years later, he communicated this discovery to the Royal Society of London, causing a sensation across Europe. In 1677, he became the first person to describe spermatozoa. He discovered yeast cells in 1680 and bacteria in 1683. In 1684, he discovered red blood cells and confirmed WILLIAM HARVEY’s theory of blood circulation with observations of capillaries carrying blood between arteries and veins. Under his lenses, he studied plant anatomy and physiology, the structure of the lens of the eye, and life histories of hydra and insects. He identified the complete metamorphosis of fleas, which eradicated popular belief in their spontaneous generation. He sent drawings of his observations to the Royal Society in more than 350 letters over his lifetime, and his findings were published in the Society’s Philosophical Transactions. Arcana Naturae, a description of Leeuwenhoek’s discoveries, was published in 1696. Leeuwenhoek continued his studies until he died at age 90 in Delft on August 26, 1723. Leeuwenhoek was a pioneering and enthusiastic microscopist whose record of observations founded the field of microbiology. Prior to Leeuwenhoek’s investigations, the abundant single­celled creatures that populate the planet were unknown. The significance of Leeuwenhoek’s discoveries was recognized immediately, and the sensation surrounding the industrious lens crafter from Delft brought visits from European royalty. Leeuwenhoek’s microscopes were of higher quality than those of his contemporaries because of his superior lenses, but he kept his techniques confidential. Therefore, his influence on the development of the microscope cannot be easily traced. His observations of biological processes that take place at the microscopic level opened up new ways of thinking to scientific investigators. His observations on the life cycle of the flea, for instance, began to break down beliefs in spontaneous generation, which was an accepted explanation of reproduction in lower levels of animal life. Such observations encouraged scientists to investigate and reformulate popularly held beliefs through microscopic inquiry, but it was not until the nineteenth century that the understanding of living cells progressed greatly. In 1838, Theodor Schwann and Matthias Jakob Schleiden proposed that all living things are made up of cells, which is a basic tenet of biology now known as the cell theory. In the late 1800s, scientists first recognized that some microscopic organisms cause diseases; such infectious diseases are still among the leading causes of human death in most countries. Studies of microscopic organisms escalated dramatically in the twentieth century, when advances in the compound microscope increased magnification to about 2,000 times.